By day I'm a musical instrument repair technician and by night I'm a trombonist and arranger/composer and sometimes a recording session musician. 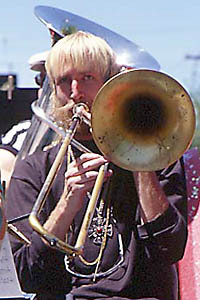 I've been involved with the Cirque de Flambé as a trombonist and composer/arranger since 1998. I've been musically directing with the Cirque since New Year's Eve 2001. My favorite beverage is coffee with ice and lots of milk. My greatest love is to play music for people. My dream is to have a group of musicians just waiting to play my compositions and arrangements at any given moment day or night and constantly begging for more. * as session recording artist.